HorseAwareness is based on the quest to expand our knowledge about the horse and reach an understanding on how to incorporate this into every day life with our four-legged friends. Anatomy and biomechanics together with ethology and behavioural science is explored in the hope of increasing horse welfare. A warm welcome to you and your horse, independent of its breed, your level, or your discipline. 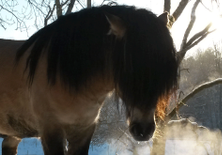 HorseAwareness is founded and run by me - Karin Stillberg. I can help you on your journey towards a long and healthy life together, empowering both you and your horse and helping you find a deeper connection. It doesn't matter where you are on your journey at the moment - whether it's preparing the young horse for a long, sound and healthy life, rehabilitating the injured horse, or just helping the middle aged horse become stronger and more confident. 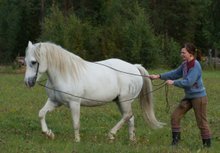 Body awareness and positive reinforcement will develop the horse's physical potential, while encouraging its enthusiasm and making it more active in the process. With an ethical and science-based interaction your relationship will also grow stronger, finding a cooperation without fear, from either side. This will benefit you and your horse greatly, both physically and mentally. Read more about what I can do for you on the different pages you can find in the menu at the top of the page. The easiest way to get in touch with me is to e-mail me. You can also find me on Facebook, where I share interesting articles and inspirational videos.